We started our week off with a bang–literally. Our city has an amazing fireworks display at a local park, complete with real cannon-fire during the 1812 Overture. Our church sets up in a pavilion during the afternoon. We play games, hang out, eat grilled meats and then gather on the park’s grassy lawn for the concert and fireworks display. It’s a fun night, and this year, the kids were able to go with us. Though it always makes me nostalgic for our hometown fireworks display, there’s nothing like hearing live cannon fire. And I enjoy the chance to hang out with our church family. We even saw Corban’s preschool teacher and had a chance to visit with her. It’s always a late night, and the exodus from the park is like a scene from an apocalyptic movie, so our group tends to hang out and eat watermelon and other snacks until the masses thin out. A super late night made for a late start to our Monday, but that was okay. We had a few things to get done in the morning and then we decided to take a local hike for part of the afternoon. 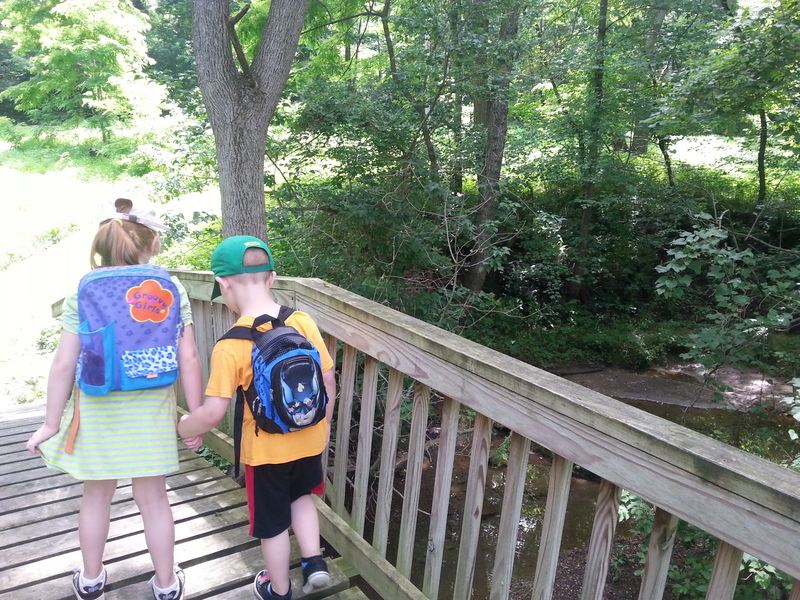 Hiking is something Phil and I have always loved to do, but we haven’t taken the kids on many hikes recently. 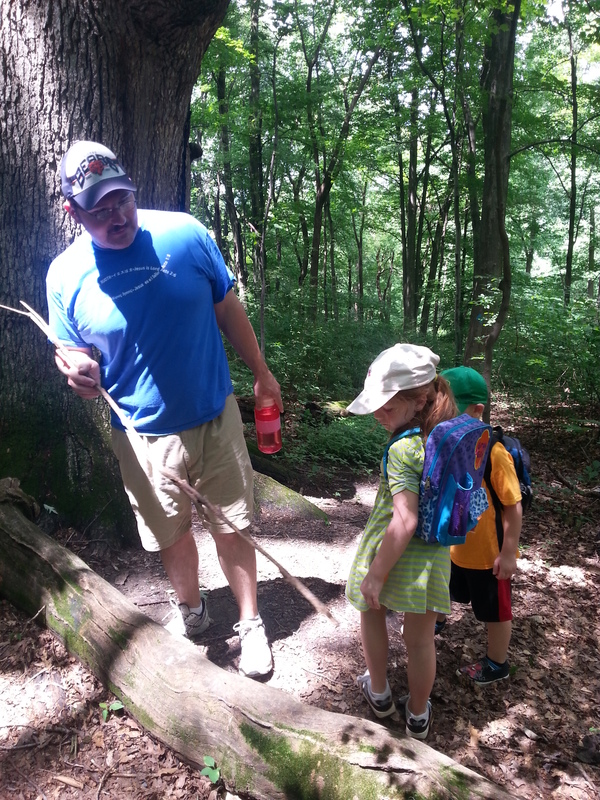 There are so many places around here to hike and that are a variety of skill levels. We picked a starter trail and spent more than an hour exploring a little piece of conserved woods. Inside the preserve, we stumbled onto oak trees that were 150-200 years old. Amazing. We didn’t see much wildlife, other than what we brought with us, but we saw lots of bugs and had some good talks about nature and being out in the woods. Corban was a bit reluctant at the start: “I didn’t want to go for a hike,” he said. “I wanted to go for a walk.” “Are there wolves and foxes in these woods?” We told him a hike was a walk, just in the woods and that any animals we might see were not interested in him. By the end of it, he had talked himself into liking it. “I love hiking,” he said on repeat. They are almost too adorable for words. Except when they’re fighting. Which apparently they don’t do in the woods. Family time is precious to us, and we have to be really intentional about getting it. As our summer together winds down (just a few weeks until Kenya! ), we’re still making memories. I think we can safely keep hiking on our approved list of family activities. The kids and I had a pretty low-key rest of the week. We had one playdate at the park and ate lunch at Chick-fil-a. The kids love stories like this, and Izzy has been to this theater with her first-grade class. We’re adding a trip there to our list of must-do in the near future. They have a great selection of children’s shows, in addition to shows for grown-ups. I love introducing my kids to the arts. And I’m grateful for places like Barnes & Noble that host events like this. There’s a big golf tournament in town this week, so some of our entertainment has been watching live coverage of our backyard on the computer and television, and logging our experiences as we drive around town. I’m not a golf fan, but I might be after this week! One more week of summer fun for us, and then our kids will be with their grandparents and we’ll be gearing up for our trip to Kenya. Thanks for reading along so far! What are some highlights from your summer so far?